Harare West MDC Alliance legislator Joana Mamombe was yesterday charged with trying to topple President Emmerson Mnangagwa's government following the January 14 protests. 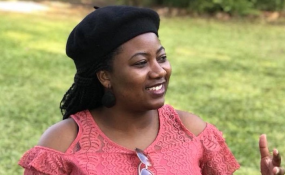 Mamombe, the youngest MP in the House, was picked by plainclothes police officers while attending parliamentary business in Nyanga before she was driven to Harare. Her lawyer Jeremiah Bhamu confirmed the arrest and said she was likely to appear in court tomorrow. "She was brought to Harare and she has been charged with subverting a constitutionally-elected government and the allegations are that she addressed a press conference on January 14 and advocated, suggested or urged people to engage in civil disobedience and called for (sabotaging of) government's essential services intending to overthrow the government," he said. The MDC reacted angrily to the arrest of Mamombe. "A team of about eight henchmen, who snatched Honourable Mamombe Boko Haram style, claimed to be from the police Law and Order section and were driving a Toyota Fortuner registration number ACI 4582," party chief whip Prosper Mutseyami said. "Honourable Joanna Mamombe had been in Nyanga for parliamentary business since February 24. "This is a result of the Zanu PF military-political settlement, which has seen them create vigilante groups and vested powers of the state to these killer units resulting in the death of at least 17 people in January and seven others on August 1, 2018." Mutseyami said Mamombe, as a legislator, was entitled to certain privileges that she must enjoy while on parliamentary business. MDC spokesperson Jacob Mafume accused National Assembly Speaker Jacob Mudenda of failing to protect opposition legislators, particularly Mamombe. Police have arrested several civil society and labour union leaders in connection with the January protests where government deployed the army, leading to the reported death of 17 people and a number of women being allegedly raped by soldiers.